Figure 1: Nonphospho and phospho-Smad2 proteins from untreated and TGF-β treated Mv1Lu cells detected by PathScan® Total Smad2 Sandwich ELISA kit #7244 showing similar optical density readings. OD 450 readings are shown in the top figure, while the corresponding Western blots using Smad2 Mouse mAb #3103 (left panel) or Phospho-Smad2 (Ser465/467) Antibody #3101 (right panel), are shown in the bottom figure. 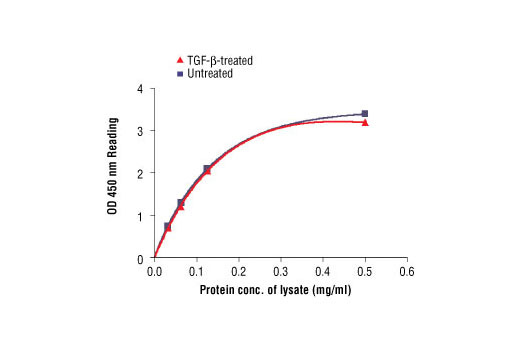 Figure 2: The relationship between protein concentration of lysates from untreated and TGF-β-treated Mv1Lu cells and kit assay optical density readings. After starvation, Mv1Lu cells (85% confluence) were treated with TGF-β (100 ng/ml) for 15-30 min at 37°C, and then lysed. Figure 3: Kit specificity demonstrated by Western blot analysis of the ELISA well captured protein is shown. Lysates were prepared from mink Mv1Lu cells and incubated in wells coated with capture antibody #3109. Wells were then washed, and captured protein was solubilized in SDS gel loading buffer. Mv1Lu lysate (lane 1) and captured protein (lane 2) were analyzed by Western blot using Smad2 Mouse mAb #3119. A single band corresponding to the Smad2 protein is detected in the captured material (lane 2). CST's PathScan® Total Smad2 Sandwich ELISA Kit is a solid phase sandwich enzyme-linked immunosorbent assay (ELISA) that detects endogenous levels of total Smad2 protein. A Smad2 Rabbit mAb has been coated onto the microwells. After incubation with cell lysates, both phospho- and nonphospho-Smad2 proteins are captured by the coated antibody. Following extensive washing, Smad2/3 Mouse mAb is added to detect both the captured phospho- and nonphospho-Smad2 protein. Anti-mouse IgG, HRP-linked Antibody is then used to recognize the bound detection antibody. HRP substrate, TMB, is added to develop color. The magnitude of optical density for this developed color is proportional to the quantity of total Smad2 protein. CST's PathScan® Total Smad2 Sandwich ELISA Kit #7244 detects endogenous levels of total Smad2 protein. 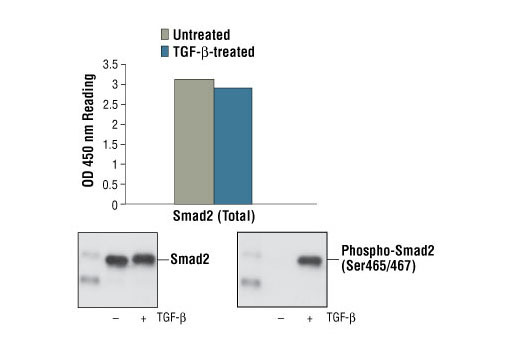 As shown in Figure 1, both phospho- and nonphospho-Smad2 proteins from untreated and TGFβ treated MV1LU cell lysates are detected by this kit. 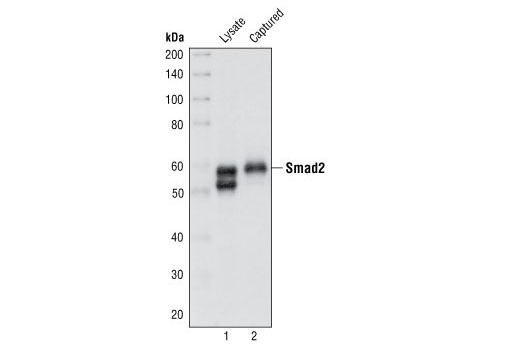 In Figure 3, Western blot analysis of protein captured in the Smad2 Rabbit mAb #3109 coated microwell shows a single band corresponding to the Smad2 protein. Smad2 in Hela cells also can be detected by this kit (data not shown). This kit detects proteins from the indicated species, as determined through in-house testing, but may also detect homologous proteins from other species.